A foam roller can be used for a variety of flexibility exercises targeting the upper and lower extremities as well as your back. It can be used to help loosen up tight tissue and provide a deep tissue massage sensation. I frequently describe the sensation as "a good hurt". 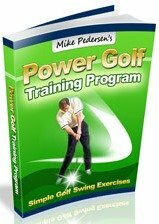 They are commonly used by athletes and in rehabilitation settings, and I think that they are a great addition to your golf fitness program. 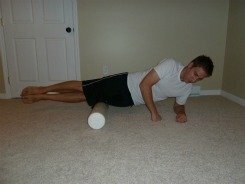 A strong upper body is recommended for using a roller! If you have any sort of upper body issue, whether its weakness or injury, that would prevent you from supporting your body with your arms, please use caution when using a roller. When trying to work on your legs with these exercises, your arms will be your main support. 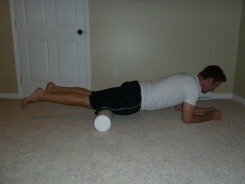 Word Of Caution: Foam roller exercises aren't for everybody! If you have any underlying orthopedic condition or injury, please consult a healthcare professional before proceeding! 1. Calves - Start by sitting on the ground with back of calves resting on the roller (roller perpendicular to legs). Using hands, push up from the ground to elevate buttocks. 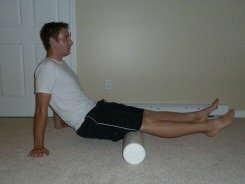 Walk with your hands back and forth, with the foam rolling underneath of your calves. 2. 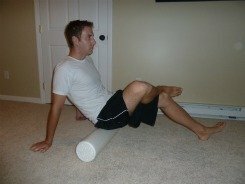 Hamstrings - Similar position as the calves, except roller is underneath your thighs. Push yourself up with your hands and roll the foam the entire length of your hamstrings and back. 3. Quadriceps - Lie on your stomach on the ground with the roller underneath the front of your thighs. Support yourself with your forearms and elbows and crawl with your arms back and forth, rolling the foam the length of the quads. 5. IT Band - IT stands for iliotibial. It is a thick back of tissue starting at your pelvis and extending down to the outside of your knee. It commonly gets irritated with repetitive motions such as running and bike riding. This is one of the exercises which you will feel the most! Lie on your right side with the roller underneath your hip bone. Prop yourself up on your elbows and forearms and glide yourself back and forth from your knee to the hip bone. 6. Hip Adductors - This is your inner thigh. 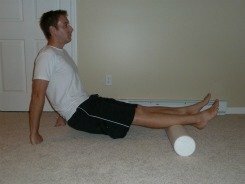 Lie on your stomach with the roller parallel with your body and the leg to be worked draped on top of the roller. Roll back and forth with your inner thigh directly on top of the foam. 7. Glutes/Piriformis - With the roller on the ground and horizontal, sit on top of it and and place your right ankle on your left knee. Roll back and forth on right buttock. Switch legs and repeat.